Material type: BookPublisher: Tulsa, OK EDC Publishing 2007Description: 24p. : col. ill.ISBN: 978-0-7945-1877-6.Subject(s): 1. Fables | 2. 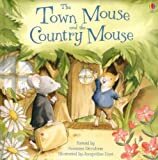 Mice - FolkloreSummary: When the town mouse and the country mouse visit each other, they find they prefer very different ways of life.